Last Tuesday marked the final day of the 2019 legislative session as we adjourned Sine Die. Below I've included a recap of the final three legislative days of this year's session - which were three of the busiest of the year. Just hours before we adjourned, Gov. Brian Kemp signed House Bill 217 - my first bill - into law. HB 217, which will enable syringe services programs in Georgia, will help us chip away at the opioid crisis, reduce the spread of HIV and Hepatitis C, protect our first responders from needlestick injuries, and save all Georgians health care costs. HB 217 is one of the most important measures we passed this year - it's a commonsense solution that will save lives and money. I'm grateful for Gov. Kemp's shared commitment to improving public health and appreciate his efforts to expand access and lower the cost of health care. On Thursday, March 28, the House fulfilled our only Constitutional obligation by giving final passage to the Fiscal Year 2020 budget. As previously mentioned, I'm particularly proud of the largest salary increase in our state’s history for teachers and certified personnel -- raising their base pay by $3,000. Our local delegation was able to secure funding for several important local projects -- including funding for the renovation of the Watkinsville library and several University of Georgia key priorities. I'm excited about $1.8 million appropriated to expand the number of medical students in the UGA/Augusta University Medical Partnership, which will help us increase access and care in this area. Last week, we continued our efforts to protect our schools and students with the final passage of Senate Bill 15, the “Keeping Georgia’s Schools Safe Act.” To ensure that our schools are actively taking precautions to prevent dangerous scenarios, every public school must conduct a site threat assessment before January 1, 2021 and then reevaluate its school safety plan every five years. This bill provides a framework that will help our schools become safer for our students and more prepared to prevent and handle various situations. One area where Gov. Kemp and the legislature have focused this year is on public safety. I'm grateful that Gov. Kemp has prioritized an Anti-Gang Task Force to study and address this serious issue in our state. On Tuesday, the House also gave final passage to House Bill 282, which will require law enforcement agencies to maintain physical identity-related evidence, such as DNA, of the perpetrator of an alleged sexual assault until the case is solved. This bill further improves the standards to preserve vital evidence and protect victims of sexual assault. Another measure that received final passage just minutes before we adjourned was House Bill 324, or the “Georgia’s Hope Act.” HB 324 will allow for the cultivation, manufacturing and dispensing of low THC oil with a lawful valid license issued by the Low THC Oil License Oversight Board. This will allow registered patients to obtain low THC oil in Georgia. While possession had previously been decriminalized, patients could not legally purchase the oil in Georgia. There are currently over 8,000 patients registered with the THC Oil Patient Registry. This legislation will establish a secure, regulated, legal way for Georgians, who suffer from serious medical conditions, to obtain this vital treatment. Gov. Kemp will now have the opportunity to sign or veto legislation over the next 40 days, and any legislation that has not been signed or vetoed will automatically become law. Any bills that have not yet passed will remain active through next year's session. With our first session behind us, I look forward to working on several measures this fall and continuing to hit the ground running in 2020. 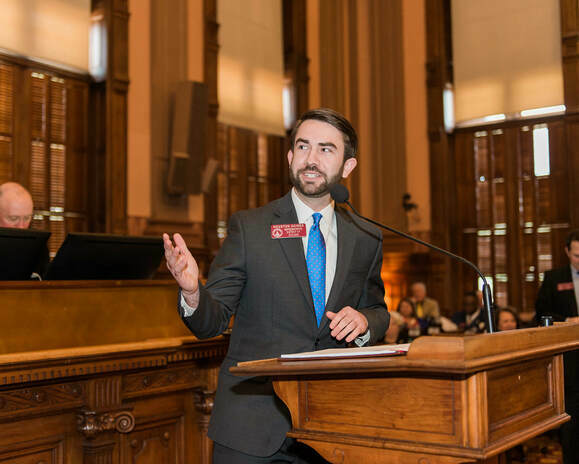 HB 588 [author] -- Non-refundable earned income tax credit: Late in session, I introduced HB 588 to create a non-refundable earned income tax credit program in Georgia. This legislation would mean a $130 million tax cut for 700,000 lower and middle income Georgians. This bipartisan legislation is an item we hope to move forward in 2020 along with other tax reform related measures, including reducing the state income tax. HB 217 [author] -- Syringe Services Programs: As mentioned above, this has now been signed into law by Gov. Brian Kemp and marks my first bill. HB 62 [co-sponsor] -- Margie's Law: This is another measure we've previously discussed in our legislative update. This bill has now passed the Senate and is on Gov. Kemp's desk for his signature. HB 161 [co-sponsor] -- Jackson Co. Board of Elections reorganization: Having already passed the House and Senate, this measure will reorganize the Jackson Co. Board of Elections to ensure non-partisan, equitable representation. HB 164 [co-sponsor] -- Jackson Co. school portion homestead exemption increase: This bill, which has now passed the House and Senate, would increase the school portion of the homestead exemption from $18,000 to $25,000 in Jackson County and save taxpayers on their property taxes. This will be on the ballot in the county in 2020. HB 520 [author] -- Moving nonpartisan elections back to November: This bill would move nonpartisan local and judicial elections from the primary back to the general election in November to increase turnout in these important elections and reduce the seven month lame duck period. Unfortunately, we were unable to move this legislation this year, but we hope to continue working on this. HB 459 [co-sponsor] -- Bus driver safety: Current law only requires public school bus drivers to have their drivers background history checked once at the beginning of employment. This measure will ensure regular checks for driver history to ensure our community's children are kept safe and secure. This has passed the House and Senate and heads to Gov. Kemp's desk.